When 17-year-old Melissa Todorovic was sentenced as an adult, she lost her anonymity as well as her freedom. When the round-faced girl with a downturned mouth and long, limp brown hair sat before a Toronto court last July and tearfully apologized for her role in Stefanie Rengel’s murder, journalists in the room knew they had to be very careful in their reporting. 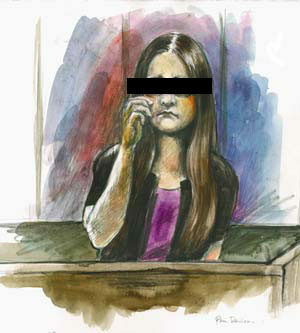 Bound by the Youth Criminal Justice Act (YCJA), they were prohibited from reporting the teen’s name or any other details that would identify her. The six-year-old act makes publishing that information illegal when a person under the age of 18 is accused of a crime. Although the journalists couldn’t identify the young woman, her identity was no secret. Her name, Melissa Todorovic, had been leaked on Facebook days after Rengel was stabbed in the stomach repeatedly and left to die in the snow outside her home on New Year’s Day 2008. So was the name of the co-accused, David Bagshaw, who carried out the murder at the behest of Todorovic, his then girlfriend. And then there was the “Free Melissa Todorovic” page set up by the young girl’s supporters. Under the act, identifying details about young offenders can’t be published (unless the offender is sentenced as an adult), whether it’s in The Globe and Mail or on Facebook. Making this information available to the public amounts to a criminal offence—which is likely news to the creators of many memorial sites. Last year, Corey Hafezi, who dated Rengel in middle school, set up the Facebook group “In Loving Memory of Stefanie Rengel.” When contacted about the site by the Toronto Star, he said he didn’t know his site was breaking the law, because some group members had posted the names of the accused. Hafezi thereafter deleted such posts when he saw them, sometimes checking the group as often as seven times a day. He subsequently warned visitors: “You are…reminded to remember that the law is in effect here. The YCJA is most definitely in effect.” But the breach had already happened; the names of the accused teens had been revealed to the group members and any other Facebook user who happened upon the online memorial. Clearly, the YCJA hasn’t caught up with the technological reality of Facebook and Twitter, which makes the law increasingly difficult to enforce. As well, some journalists complain the act means they can’t produce full accounts of youth crime. So is it time to revamp the YCJA? Henry, who stresses his views about the YCJA are his own, not the CBC’s, praises the “well-meaning motivation” behind the act, which is to ensure that young offenders are given a fresh start at 18. But he thinks we should have a system that encourages accurate information and answers, as opposed to one that assists rumours. There are more adults on Facebook than Sack assumes. The social networking site has more than 12 million Canadian subscribers and the fastest-growing group of users is over 35, a demographic that includes people who could potentially be selected for a jury.